EcoFriendly Sask is pleased to announce grants to Whitespace and Saskatoon Cycles to support the following projects. Flavio Ishii, Whitespace, is developing an open source mapping and organization tool to help urban fruit harvesters, such as Out Of Your Tree in Saskatoon. The tool, called Pando Branches, will spread and automate much of the workload for coordinating the harvest of fruit trees in urban Saskatoon neighbourhoods. Neighbourhood coordinators, harvest volunteers, tree owners, and charity groups will all be part of this system. Pando Branches will capture tree type and volunteer data sorted by neighbourhood, later to be viewed in visual reports and on an interactive map. The resource will be available and customizable for other fruit harvesting organizations across Canada. The $500 EcoFriendly Action Grant will pay for a three-month membership at The Two Twenty for the Saskatchewan Intercultural Association (SIA) mentorship program's intern who will assist Flavio with the project while gaining Canadian work experience. Out Of Your Tree is a Saskatoon grassroots group started by Danae Taylor in 2011. It has over 60 volunteers, over 30 fruit tree/bush owners, and 5 charities signed up. 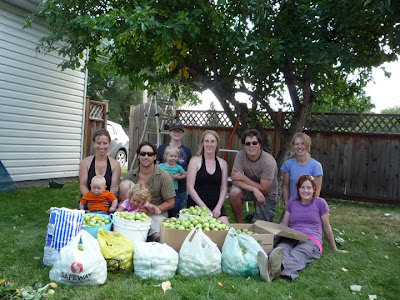 Volunteers will harvest the fruit rather than leaving it to go to waste. One third of the fruit will go to the tree owner, one third goes to the volunteers, and one third goes to charity. The PotashCorp Fringe is one of Saskatoon’s biggest summer festivals. EcoFriendly Sask wants to encourage people to cycle to the event, so we’re contributing $500 to Saskatoon Cycles to ensure that the Bike Valet will be up and running at the Fringe. The Fringe and Saskatoon Cycles are also lending their support. The Bike Valet will be in place at Taste of Saskatchewan, Toontown Smokedown, SunCycle, and the Fringe. As part of an ongoing effort to “green” the PotashCorp Fringe, plans are being developed for a Buttons on the Bus program to encourage participants to use public transit, and staff are talking to Loraas about a comprehensive on-site recycling program. Our original plan was to offer grants on a monthly basis. We quickly realized that this schedule was far too rigid. Groups needed help now, not later. In future, we will be considering grant applications on an ongoing basis. We’re not looking for elaborate proposals, but we do need enough information to help us make wise decisions. So, describe your project, explain why it is important, and provide a detailed explanation of why you need financial support and how you will use the grant money if you are successful. See our Action Grants page for details of past grants.